This course will be taught by Sat Dharam Kaur ND in English with Chinese translation, combining the Healthy Breast Foundations Program with the Healthy Breast Yoga Program. The first 6 out of 12 modules will be taught. The Healthy Breast Foundations Program is a stand alone program for optimizing breast health and preventing breast cancer. It is the introductory course for the Healthy Breast Program, and is the prerequisite for the Healthy Breast Yoga Teacher Training Program, which is geared towards anyone interested in yoga applications for breast health. It consists of 12 modules with Sat Dharam Kaur ND guiding you through the many facets of breast health – hormonal, environmental, dietary, nutritional, psychological and spiritual. Each of the twelve modules includes a home practice program. The Healthy Breast Yoga Program includes 12 different kundalini yoga sessions, focussed on various aspects of breast and whole body health. Each of the yoga sessions includes a pranayam, kriya (series of asanas) and meditation, in the style as originally taught by Yogi Bhajan. You will be provided with the Healthy Breast Foundations and the Healthy Breast Yoga workbooks to easily assimilate and integrate the material in each module. 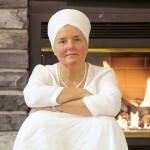 The course combines lecture (40%) with Kundalini Yoga (40%) and small group exercises (20%). The course is dedicated to women interested in reducing their risk of breast cancer or a recurrence, as well as yoga teachers and health professionals passionate about educating women in breast health. The Healthy Breast Foundations and Yoga Program is both an In-Person and Online course consisting of 12 modules. Become more mindful in your cooking and eating practices. Certification is available to you to become a Healthy Breast Educator and/or a Healthy Breast Yoga Instructor after completion of the complete course of 12 modules (this is Module 1 of 2) and after handing in the written assignments relevant to each of the twelve modules, as well as a video of you teaching one full module to a client or group. Anyone is invited to attend the program, but certification as a Healthy Breast Yoga Instructor is available only to KRI certified Kundalini Yoga instructors who have also completed the Healthy Breast Foundations Program. This course combines both programs, so you will be eligible to be certified as both a Healthy Breast Educator and a Healthy Breast Yoga Instructor after completing the home practice program for each course and submitting a video of you teaching.